Total Assets are a total amount of assets owned by an entity or an individual. Assets are items of monetary value, which are used over time to produce a benefit for the asset’s holder. In case of the owners of Assets are a company then these assets are stated in the balance sheet for the accounting records. Let’s assume Company Anand Ltd have stated $15 million of debt and $20 million of assets on its balance sheet, we have to calculate Debt Ratio for Anand Ltd. This shows that for every $1 of assets that Company Anand Ltd has, they have $0.75 of debt. A ratio below 1.0 indicates that the company has less debt than assets. We need to calculate the debt ratio of Jagriti Group of Companies. A debt ratio of Jagriti Group of Companies is 0.45. The following figures have been obtained from the balance sheet of the Anand Group of Companies. We need to calculate the debt ratio of the Anand Group of Companies. A debt ratio of Anand Group of Companies is 0.36. The debt ratio measures the weightage of leverage in the capital structure of a company, it is further can use for measuring the risk. If the debt ratio is high, then it shows the company is having a higher burden of repaying the principal and interest and it may impact the cash flow of the company and can create a glitch in financial performance or the situation of default may arise. Assets and Liabilities are the two most important terms in the balance sheet of any company. By looking these two items the investors can interpret whether the company has enough assets to pay off its liabilities. And this what we call the debt ratio. Debt ratio can be used as a measure of financial leverage. If a company have the Debt Ratio greater than 0.50 then the company is called a Leveraged Company. This shows the company has more debt funding in its capital structure. If the company have a lower debt ratio then the company is called a Conservative company. 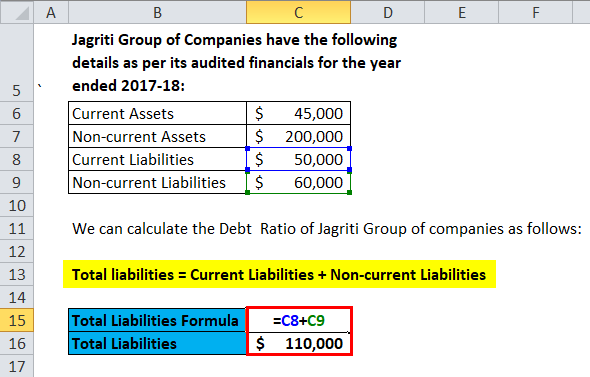 Debt ratio formula can be used by the top management of the company to take the top-level decision of the company related to its capital structure and future funding. By using Debt ratio, the top management can take decision for raising the funds. Whether they want to raise funds from external sources like loan or debts or through equity. If the company have enough capitals to repay its obligations, then they can raise fund from external sources. 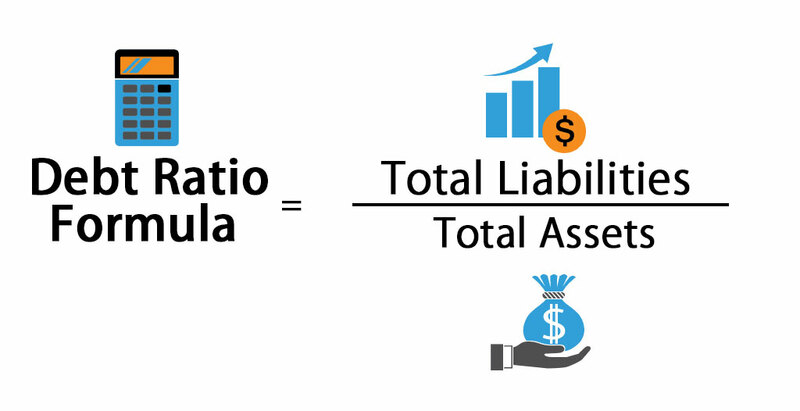 Debt Ratio formula can be used by the investors who want to invest in the company. 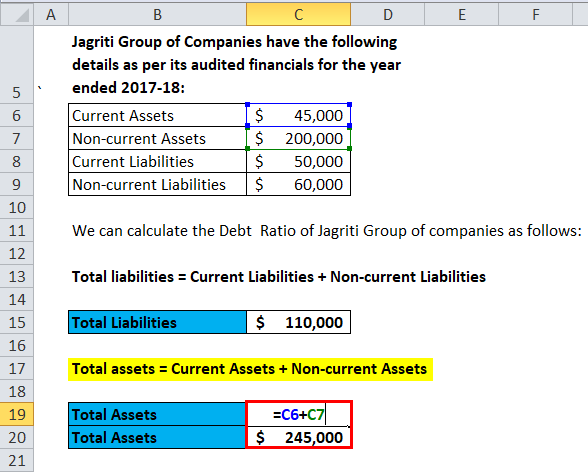 This formula shows whether the firm has enough assets or capital to repay the debts and other obligations. As the company pays dividends to shareholders after paying all the debts and obligations of the company. If a company have Debt Ratio lower than 0.50 shows the company is stable and have a potential for longevity. A company can raise more funds from outside for the expansion. For every industry, the benchmark of Debt ratio may vary, but 0.50 Debt ratio of a company can be a reasonable ratio. This shows that the company has two times assets of its liabilities. Or we can say, the company’s liabilities are 50 % of its total assets. If a company have Debt Ratio of 1, this means the company has total liabilities equals its total assets. Or we can say, if a company wants to pay off its liabilities then they would have to sell off all of its assets. If the company need to pay off the liabilities, they need to sell off its all assets and in that case, the company can no longer operate. 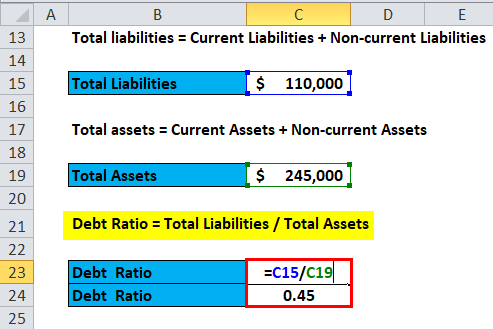 You can easily calculate the Debt Ratio using Formula in the template provided.